Helping Heart is an innovative patch which aims to enable donations to homeless people through contactless payment technology. It can be sewn in or onto various items. 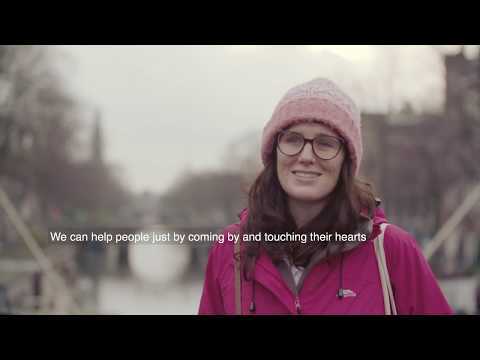 The Helping Heart prototype was first launched in a winter coat for homeless people to wear, by Dutch advertising agency N=5 in December 2016 in Amsterdam. The press dubbed it the ‘PIN jacket’, and the coat with the integrated patch allowed people to donate one euro by simply tapping their card on it. The only way to spend the money received this way is through an official homeless shelter. The money is always redeemed in kind: a place to sleep, a shower or food. The homeless person can also choose to spend it on longer-term support, like vocational training courses or even choose to build up some savings. The Helping Heart prototype jacket was positively received in the Netherlands by the homeless people, who used it, and the shelter involved, as well as the members of the public who donated. Several organisations and companies also reached out to N=5 to be part of further development explorations. This led to N=5, Five Degrees, MediaMonks and TSIP combining their expertise in a shared ambition to help more people get back on their feet through the Helping Heart initiative. As the project develops, the team’s focus is to test and develop the product, and its integration into an associated program of support, carefully. To do that, the team will draw on the help and input of experts in the homelessness sector, as well as those with lived experience of homelessness. Provide a way for people to give directly to a homeless person on the street, that is safe and secure for everyone. Create an empathic connection between those wearing the Helping Heart, and other members of the public. Find a way, through the design of this programme, to empower users to get back on their feet and help others dealing with homelessness. MediaMonks is responsible for the technical realisation/manufacture of the patch. "From day one our ambition was to work towards a sustainable solution which offers a better perspective to the homeless around the world. We are thrilled to have found partners in MediaMonks, TSIP and Five Degrees. Together, we can possibly make a true impact on the world with our ideas." "As a social consultancy, our work is focused on helping to tackle some of society’s biggest challenges. This is what drew us to the Helping Heart project. As this initiative develops, it’s crucial that we have the support of people who are experts in the homelessness sector, and that we continue to develop and test the product with people who have lived experience of homelessness. And we’re currently reaching out to possible partners across the sector." "Our solutions enhance a cashless society. This is convenient for most people, but not for everyone. The homeless for example. We feel it’s also our role and responsibility to make the technology we built available for people who still depend on cash today." "We loved being a part of this innovative solution to make it easier to support those in need. Cash is king, but contactless is the future and we’re excited to see this project roll out on a global scale." More and more, we’re relying on our smart cards to make even the smallest of purchases. Yet there are still some in society who depend on cash to survive, such as the homeless. This led to the idea of the Helping Heart patch in December 2016, bringing together the ease of contactless payment technology with social engagement. The money that was paid by contactless transactions was transferred to the Amsterdam homeless shelter StoelenProject, where the money could be spent on a night’s sleep, a shower and some food, or to help the person rebuild their life, for example, by paying off debts, securing a deposit for a rental property, or a training course. Together with MediaMonks, N=5 combined existing technology in a DIY solution in order to get the system to function.